Returning home for a visit to the country I grew up in, I had a feeling of nostalgia. After 15 years abroad, I had the chance to return to Argentina, bringing with me many memories of the things I wanted to do. I visited the place where I used to play, where I used to study, where I used to stand for a bus to school, where I used to play video games, where I fell in love for the first time, where I developed a passion for soccer, even where I got robbed. In a short amount of time I did more than just visit Buenos Aires, I relived it. Experience the magic of my hometown yourself; Expedia Buenos Aires has current hotel and airfare. Let me not only show you the most important and typical places to visit, but take you beyond where the average tourist will go. Before I begin, Happy 200th birthday to Argentina’s Flag. During my stay in Buenos Aires, Argentina celebrated their Bicentennial celebration of their country’s birth with a special 3D presentation in Cabildo in Plaza de Mayo. 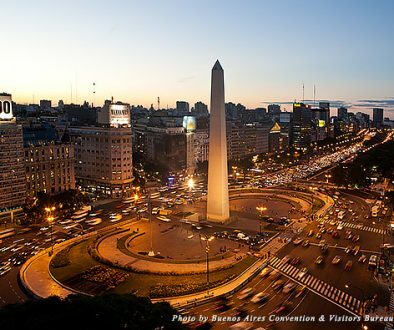 Without a doubt, El Obelisco is the first thing in your to-do list in the city. 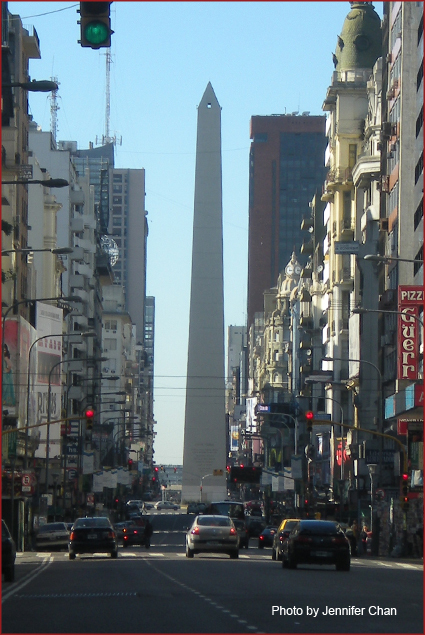 The most visited landmark representing Argentina, El Obelisco is a modern monument built in 1936 to commemorate the 400th anniversary of the first founding of the city. It is located in the center of the Plaza de la República (Republic Square), the spot where the Argentine flag was flown for the first time in Buenos Aires. It is also situated in 9 de Julio Avenue which also happens to be the widest street in the country, or as a fellow Argentine might brag, the widest street in the world. It consists of 4 street parallel to 9 de Julio Avenue, creating 5 streets combined from North to South, 2 to 3 lanes per street with plazas in between, with traffic lights. That’s what I call a wide avenue. Try once to cross the street and time yourself. It’s quite fun, and you can burn some calories from alfajores (biscuit cookies)! This should be the second place you visit in the Capital Federal of Buenos Aires. It is the birth of the country with many historic buildings. In Plaza de Mayo you will find a pyramid engraved with the birth date of the country. I was in the right time for the Bicentennial. 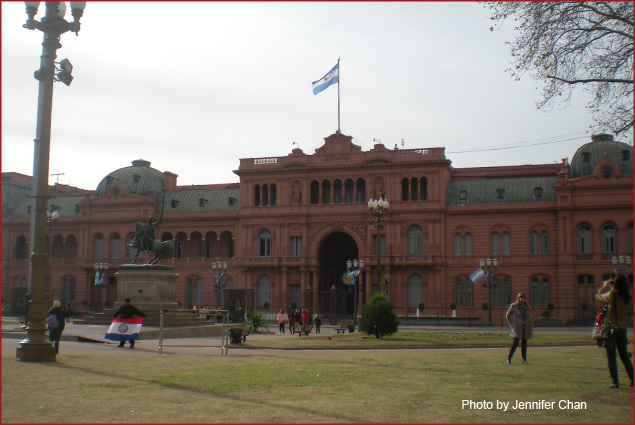 Surrounding the plaza, you’ll find The Pink House, or La Casa Rosada. This is where the President of the nation is situated and where most protests take place as well. 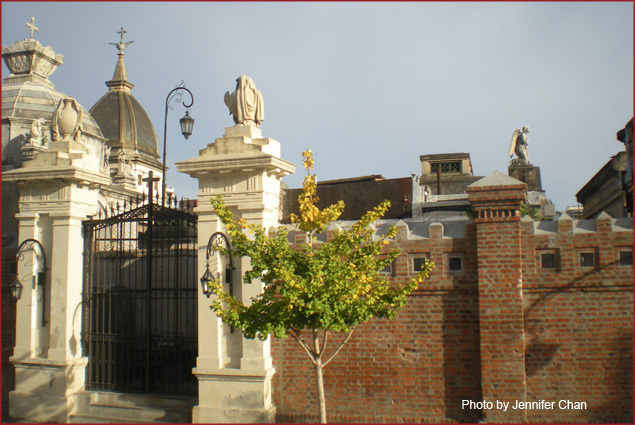 The Cabildo building, is where the President of Argentina used to stay before the Pink House was built. The Cathedral, or La Catedral, on the north side of Plaza de Mayo, close to Cabildo, it is the first church of Buenos Aires. You’ll find great photo opportunities here. 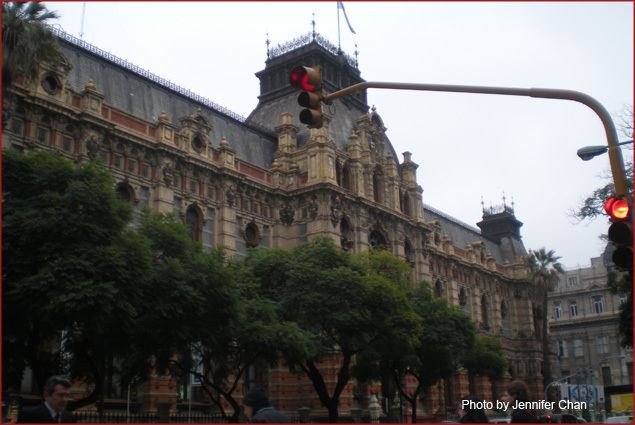 Spend a couple of bucks and feed the pigeons in the center of the plaza, it is one of the fun activities in the Plaza de Mayo besides taking pictures of important landmarks. Another interesting thing to see is the war veterans of the Falkland Islands. They are always camping out in the plaza and can’t be missed. The Argentine people still believe the islands belong to the nation. I’m with them on this issue! 15 years ago—Chinatown consisted of 1-3 blocks. It was a mostly Taiwanese-dominated area with one main supermarket of Taiwanese products called “Casa China” (China House) and restaurants boasting specific cuisines. 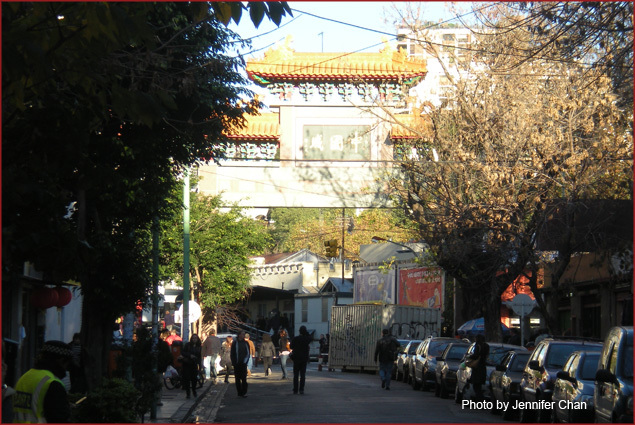 Chinatown today—Chinatown covers roughly 6 to 8 blocks, mostly Mainland Chinese influenced. There are many supermarkets carrying Chinese and Taiwanese products, and restaurants with similar cuisines, which means more competition and cheaper bills for you. Visit “La Casa China.” Compared to other shops this market is extremely small, however, this shop is one of the first that made Chinatown what it is today. Chinatown is in the city of Belgrano. 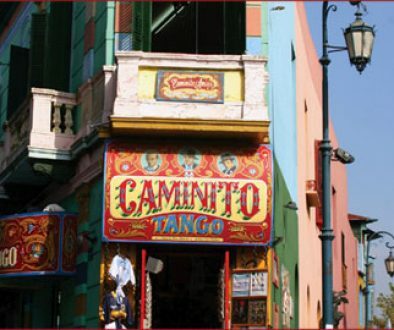 La Boca features “El Caminito.” This is where you can get a taste of Tango, the national dance. All the restaurants and shops features tango dancing and singing performances. Tips and Tricks: There will be many people giving you menus encouraging you dine at their restaurant and promising you a great tango show. This is definitely true, all the restaurants are great, but, if you are trying to say “no” to it, the best way is to say “Ya comi” meaning “I already ate” And, if you’re a girl, don’t be surprised by these guys flirting with you even though you’re already a block away from the restaurant. 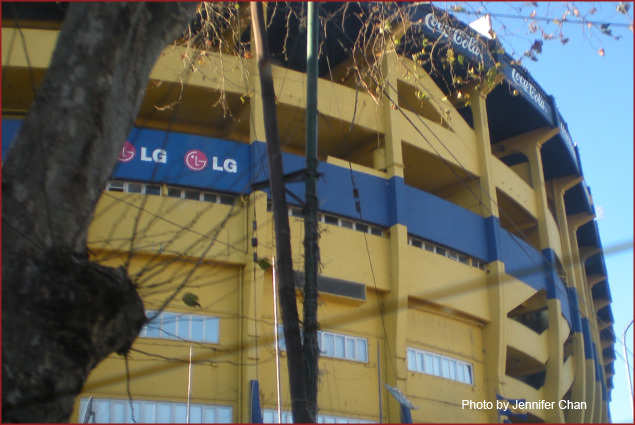 Boca Juniors Stadium is also known as la Bombonera or The Chocolate Box because it is shaped like a bon bon box. 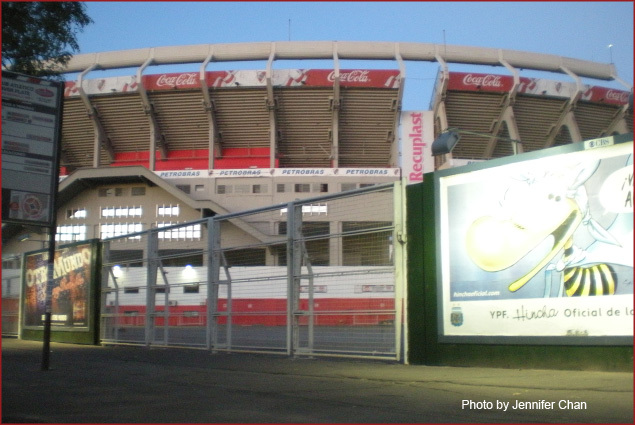 It is the home of Boca Juniors, one of the most successful soccer teams of all time, just like River Plate. Boca’s and River Plate often compete, so there are many rivalries and turf wars between the two. The most watched matches in the country. Called “El Clasico,” are always between Boca and River. Former player Diego Maradona often visits the stadium when Boca is playing. Since this is in the city of La Boca, with its famous colored houses, you will also notice houses painted with blue and yellow horizontal stripes, the colors of Boca Juniors. It’s best to avoid wearing a River jersey. Tension runs high, so be careful. 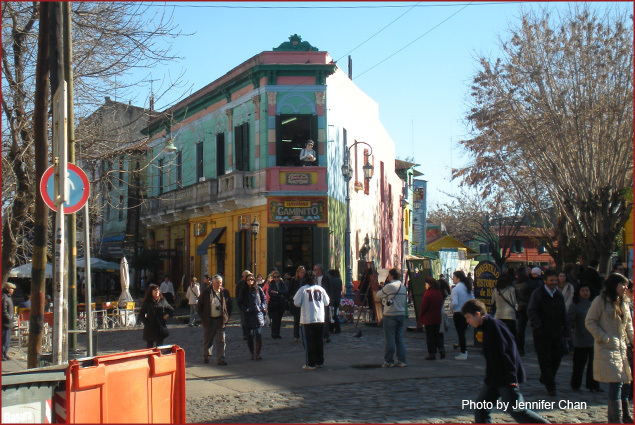 In San Telmo you will find many people speaking in different languages. This is probably the most international you can get in one long street full of antique shops and street performers. Many stores showcase antiques used in Colonial times in Buenos Aires in the 18th and 19th century. 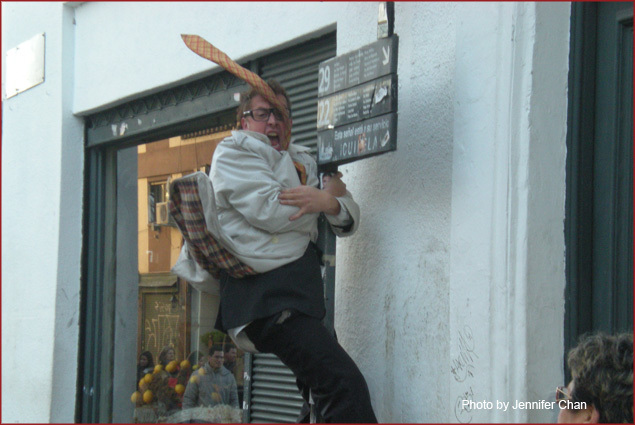 You will enjoy street performers like human statues, celebrity impersonators, and other silly ones to make you giggle through the shops. Tips and Tricks: The sellers know you’re foreign, even my brother, who is Asian. Though he has been living there for more than 15 years and speaks decent Spanish, to the eyes of an Argentine seller he is considered a foreigner. When you ask for a price, be sure to listen carefully. 100 pesos is a lot different than 100 dollars. During my stay, the exchange rate was 1 dollar to 3.83 Argentine pesos. The airport exchange (JFK) only gave us 2.54 for our last 400 pesos! The Chickens, from people who are fans of other local soccer teams, especially fans from Boca Juniors. It is also a music venue for international and local stars. Michael Jackson once performed here in the 90’s in his Dangerous World Tour. It’s a great site to visit—just don’t wear Boca jerseys around here. This cemetery is mainly dedicated to Argentine figures who contributed in helping the nation politically and economically. Many entertainment celebrities and political figures rest here, including Eva Perón, or simply Evita. This is a newly-developed park dedicated to women. 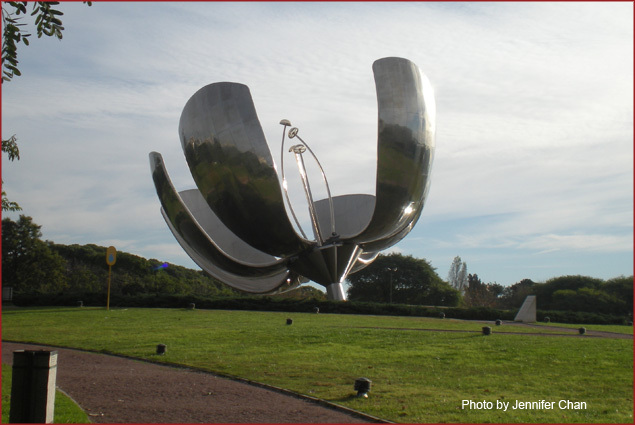 It showcases a giant metallic and electric flower with metallic petals that “bloom” at 8am in the morning and close at sunset every single day. Built in 2004, this is truly another gorgeous site to visit. A planetary showcasing anything related to the solar system, along with views of the sky in the Southern Hemisphere. It is populated with kindergarten to university students during weekdays. Another great photo op. 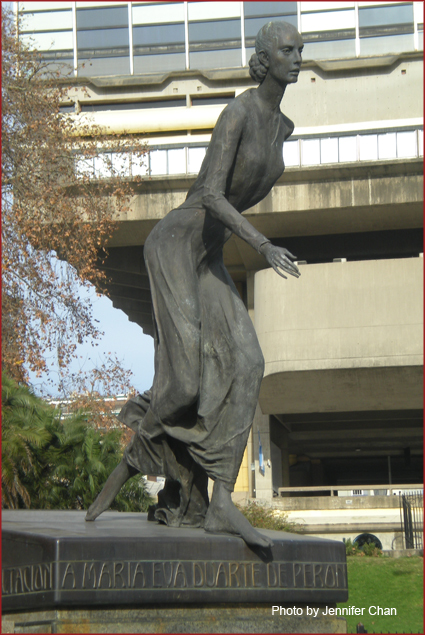 This is a dedication plaza with a statue of Eva Perón, one of Argentina’s most important political figures. She was the first woman president of the Nation and the wife of one of the most famous presidents in Argentina, Juan Perón. Today, Argentina has another female President Cristina Fernandez de Kirchner, wife of the previous president Néstor Kirchner. History repeats itself. 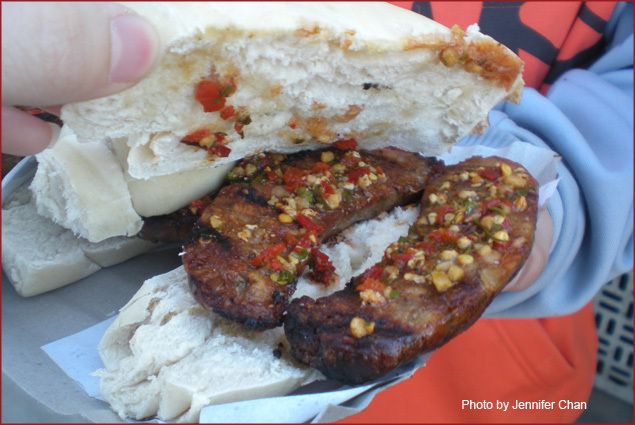 ChoriPan is a french baguette with grilled sausage (chorizo) with a sauce of your choice. The image shown has the classic chimichurri sauce. This is a very popular sandwich in the city. Choripanes are often eaten as appetizers, but, as it is available in almost every park, stadium and tourist area, you can have one anytime and make it your main dish. They are not to be missed! Before Pizza Hut tried their debut in Argentina in the early 90’s, pizzas were everywhere in the neighborhood. Just like Starbucks in the United States, it is in every corner. Local pizzerias dominate because people love homemade food. These pizzerias have the exact flavor they want, and a great price. 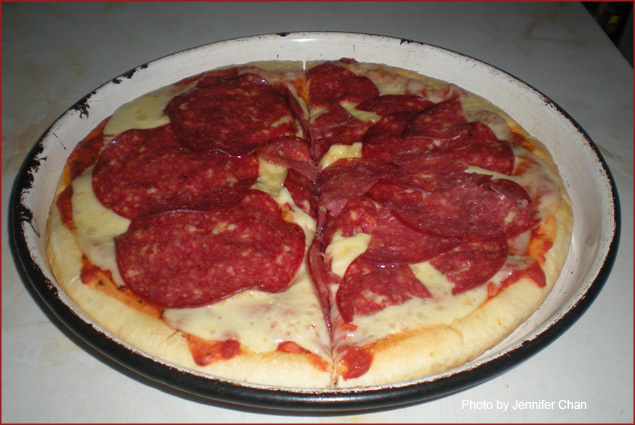 Would you pay $11 pesos for a medium-sized pizza from Pizza Hut in the wealthy side of the town or $3.50 pesos for a homemade large pizza on the corner of your street? No wonder Pizza Hut went out of business within a year. 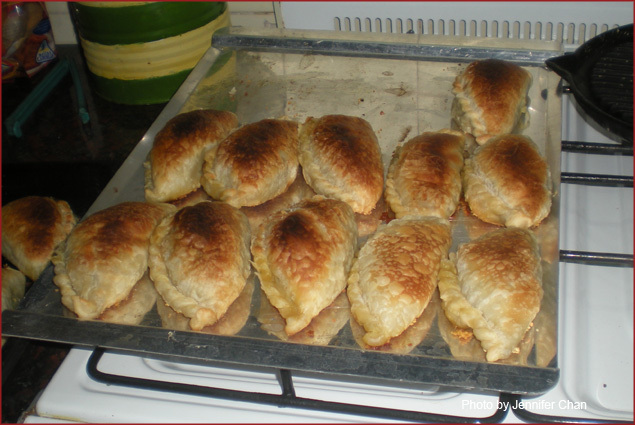 One of my favorites, emapandas are a dough of wheat flour and lard typically filled with chicken or beef. I grew up eating the ground beef versions. I prefer homemade, however, empanadas in restaurants also have a distinct flavor that you shouldn’t miss. A great place to have one is in San Telmo. Who knows, you may even have a bite for free! Also served at almost any tourist site and parks, mani are cooked nuts candied with brown sugar and regular sugar. They are quite sweet so be sure to have water with you. This is a typical snack for window shopping. To find one, just follow your nose to their sweet smell. 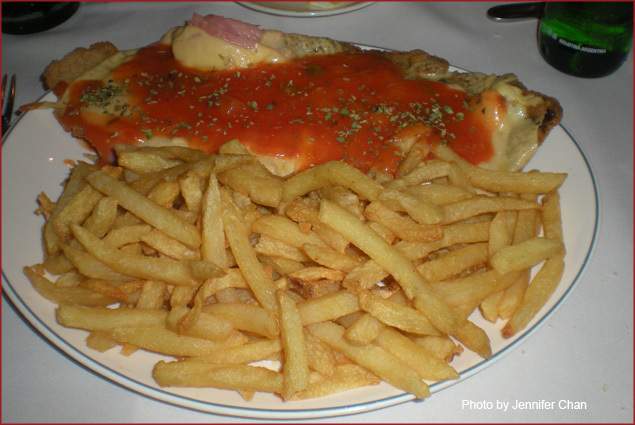 Milanesa is thinly sliced beef, veal, or sometimes with chicken dipped in egg and covered in breadcrumbs then fried. The version I really missed was the Milanesa Napolitana. In addition to the breaded meat it has cheese, ham, ketchup, and oregano. Usually served with fries. Consists of two round sweet biscuit joined together by any type of jam, usually with dulce de leche covered with powdered sugar and/or chocolate. In most alfajores there are two layers of cake, and a filling in between. Try alfajores from Milka and Jorgito. 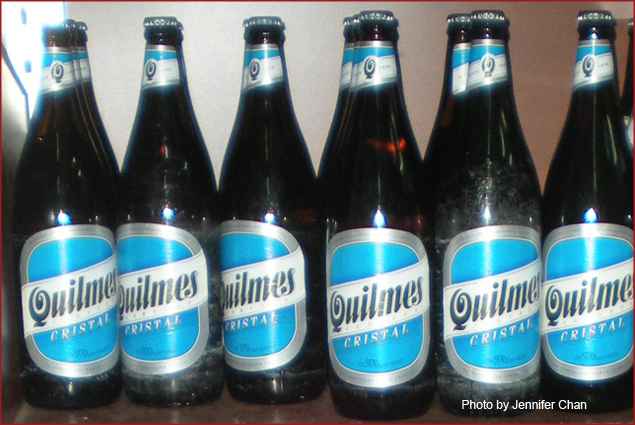 Quilmes is the national beer, equivalent to Budweiser in the States, and the beer was originated from the city of Quilmes, just southeast of the Capital Federal of Buenos Aires in the Province of Buenos Aires. They also have a soccer team Quilmes Atlético Club. Mate is a traditional drink in Argentina and their neighboring countries. It is prepared by steeping dried leaves called yerba mate in hot or cold water. Adding sugar is optional but most of the people I know always add sugar. To drink it, you need a metallic straw called la bombilla. Asado is everywhere—at the store, in the parks, even your neighbor in Buenos Aires is probably BBQing right now. Asado is probably the number one food consumed in the country. 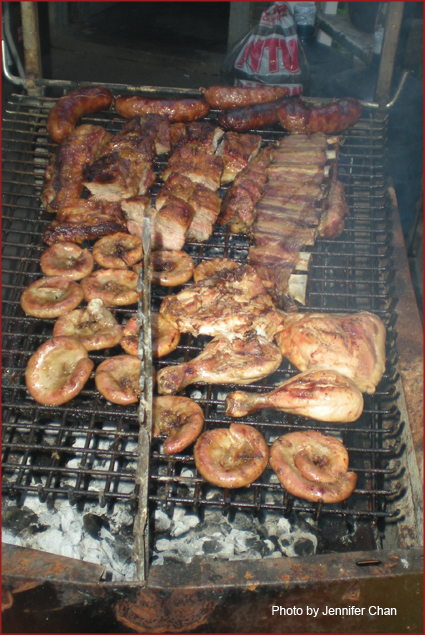 Asado consist of: Beef, chicken, pork, ribs, chitterlings, bread, sausage, or blood sausage. You can eat for brunch, lunch, as an appetizer or snack, and for dinner. Asados are almost always eaten on Sundays. My favorites are Asado, Chorizo, Salchicha, Churrasco, and my dad’s favorite, now mine, Vacio. 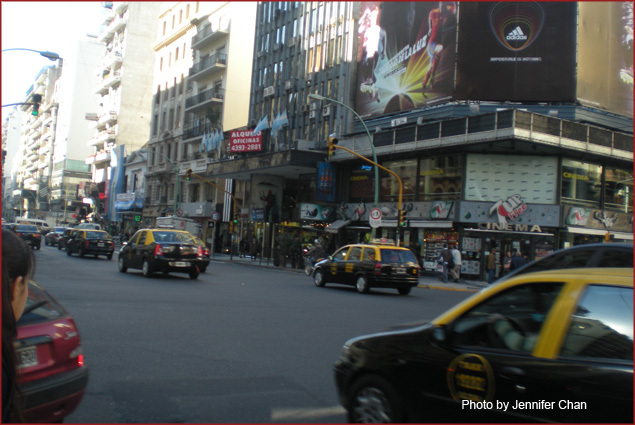 In Buenos Aires, streets are usually narrow with mostly one-way streets and high-rises that are so alike that you could easily get lost. There are many modes of transportation for easily getting from point A to point B. The bus, subway, and taxi systems are quite efficient, with waits of about 3 minutes for buses and trains. Taxis are everywhere. Even with these massive transportation systems some people still prefer to walk as a way to stay healthy. One additional transportation system is called Remis or Remises. They are just like a taxi with no indication that it’s a taxi. What’s great about remis is that once they drop you off in a destination, they wait for you for up to 5 minutes, in case you were just at the destination for a short amount of time, and the fee is already fixed and arranged ahead of time so that you don’t have to worry about the next payment for the next destination. To acquire a remis you either have to ask someone who knows a number to call or getting a card from a remis driver. Now you’ve got an inside look at Argentina from a Buenos Aires native. Whether it’s soccer, tango, or BBQ, you’re sure to fall in love with Argentina’s romantic and exciting capital city.